Mrs. Parks’s non-cooperation was courageous, but it wasn’t an isolated act. She had been an activist for most of her life, and was chapter secretary of the local NAACP. 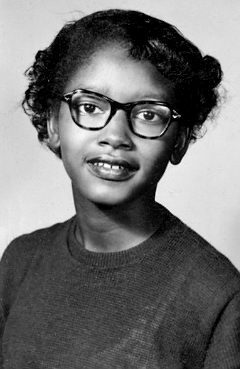 She had taken a summer course at the Highlander Institute, where she read about civil disobedience, the Constitution, and the Brown versus Board of Education decision. 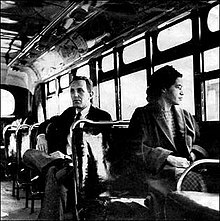 She also wasn’t the first person to defy segregation laws on the city buses; earlier that year, Claudette Colvin (at right), then fifteen, was arrested for the same offense, but local activists were reluctant to organize around her. She was young, less experienced, pregnant, and not married. Image matters. Mrs. Parks herself became an icon of the movement–and indeed, in American history. When I ask my students to list heroes of the American civil rights movement, she is second only to Martin Luther King in mentions. Often, students know no other names from the movement. Twenty-five years after her arrest, Mrs. Parks’s celebrity brought her an appearance on a game show, To Tell the Truth. In the video below, you can watch celebrities question her–and two impostors–about the bus boycott. It’s bizarre and compelling. The last questioner is comedian Nipsey Russell, who uses his brief turn to shout out to other important, courageous, and now lesser-known heroes of the movement. This entry was posted in Uncategorized and tagged bus boycott, celebrities, civil rights, Claudette Colvin, Highlander Institute, Martin Luther King, Montgomery, NAACP, Nipsey Russell, Rosa Parks, segregation, To Tell the Truth. Bookmark the permalink. It is amazing on so many levels. I was struck by how much closer serious to frivolous was at this point, and also that Nipsey Russell had actually participated in the movement years earlier. Is it too much of a cliche that the one black member of the panel was the only one who recognized Rosa Parks? again another great post! First time ever I saw Rosa Parks in a video, a truly noble woman. Keep up the good work on this blog. It’s also interesting to note just how much deference everyone else on stage was willing to give her–even on a silly tv game show.